Fifteen years ago, the IM Flash facility sat vacant near Point of the Mountain. At that time, the three-million square foot facility sat unoccupied like a ruinous monument to thwarted ambition and “go-big or go home” dreams. 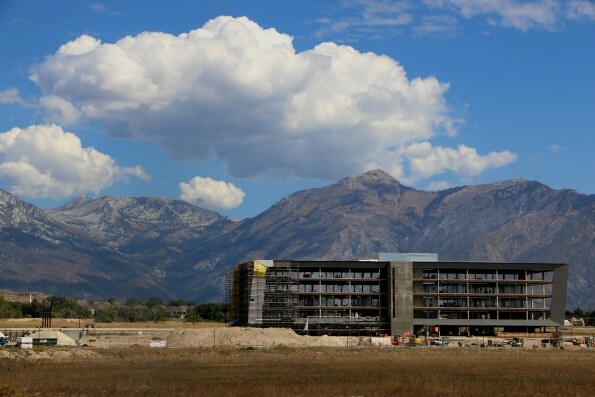 The facility was an eyesore until the state made its first of many sizeable bets on Utah’s tech future, a $15 million tax incentive for the company to stay in Utah. Members of the Utah Governor’s Office of Economic Development (GOED) have prided themselves on coups of corporate courtship when it comes to wooing out-of-state businesses thanks to tax incentive packages. For GOED’s Michael Sullivan, the work his office has done building Utah’s “silicon slopes” is a personal point of pride. The “slopes” at one time were simply a forgettable expanse of sagebrush and occasional gas stations between south Salt Lake County and the north end of Utah County. Now the area is a thriving center for billion-dollar tech startups, and Sullivan looks back fondly to the time his office was criticized for giving out a total of $80 million in tax breaks to IM Flash. “Now we got a world class, better-than-Singapore, manufacturing plant producing the highest quality, fastest flash technology chips in the world,” Sullivan says. He says the Governor’s focus on building a strategic industry cluster at Point of the Mountain has dominoed since the office helped get IM Flash back on its feet. The GOED worked to guide area local zoning and regulations to prime it for high-tech companies, but of course the office can’t take all the credit. Affordable electricity makes it enticing, and the U of U, BYU and UVU produce a well-educated labor pool for the flourishing tech industry. The GOED’s tax incentives aren’t given up front. Companies don’t receive breaks on sales taxes and corporate income and payroll taxes until they start meeting their goals. So far, Utah’s tech companies are pushing to achieve their goals. Software company MaritzCX was given a seven-year incentive of $2 million to add 425 new high-paying jobs that would add $268 million in new wages. EMC Corp expanded in Sandy thanks to a $3.8 million incentive from GOED, and Varian Medical nabbed a $7.7 million incentive to bring 1,000 new jobs and $460 million in new wages over 15 years. Most recently, Vivint Solar received a $26 million incentive to bring over 3,000 jobs and over $1 billion in new state wages in the next 10 to 15 years. The multi-billion dollar buzz of the Silicon Slopes is powering jobs, industry and the creative genius of would-be tech pioneers in the valley. Google Fiber is now in Provo and coming soon to Salt Lake City, and what once was dirt and scrub is now glittering office parks and developments.